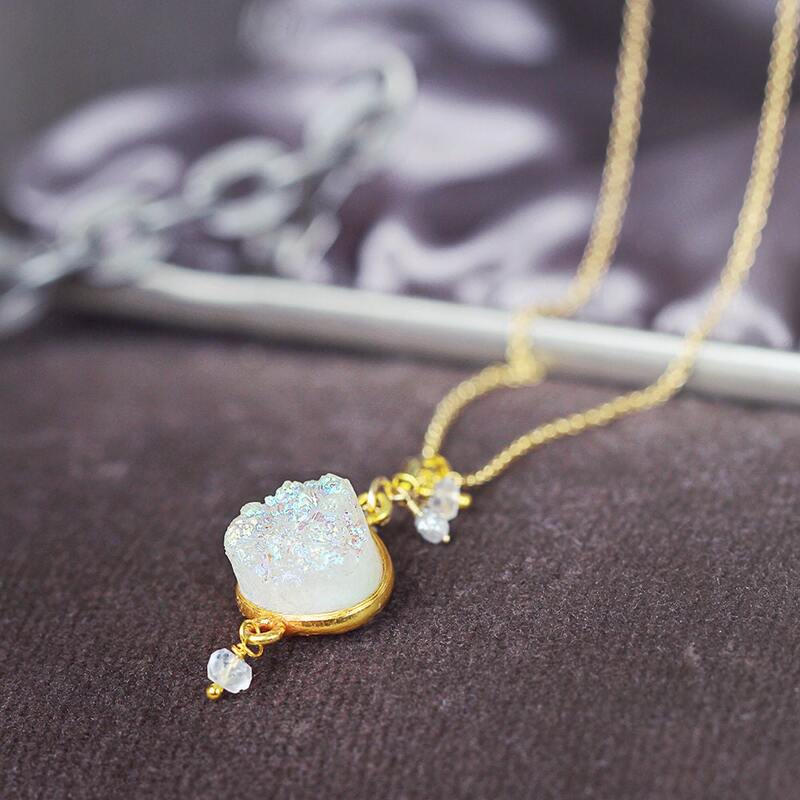 This opalescent druzy, diamond and moonstone necklace is simply stunning. It will certainly add sparkle, style and statement to any outfit this season. A perfect party necklace to help you breeze through all your evenings with style and ease! Featuring a teardrop shaped druzy stone with an iridescent finish - the colours are beautiful and mesmerising, reminding me of a mermaids tail! 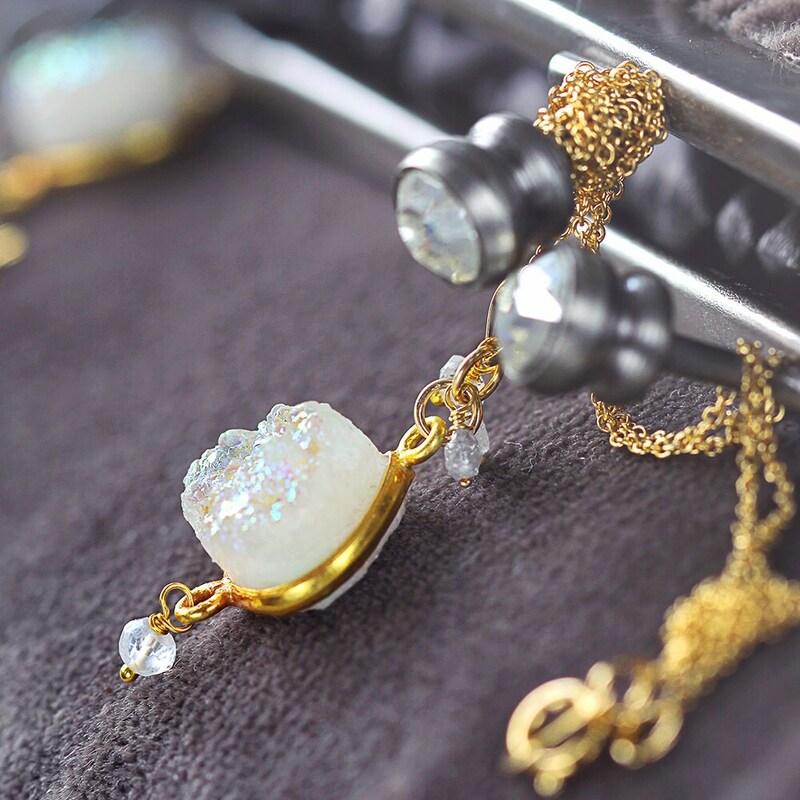 Above the druzy hangs a delicate little cluster of gemstones, including two rough silvery-white diamonds and a single moonstone. 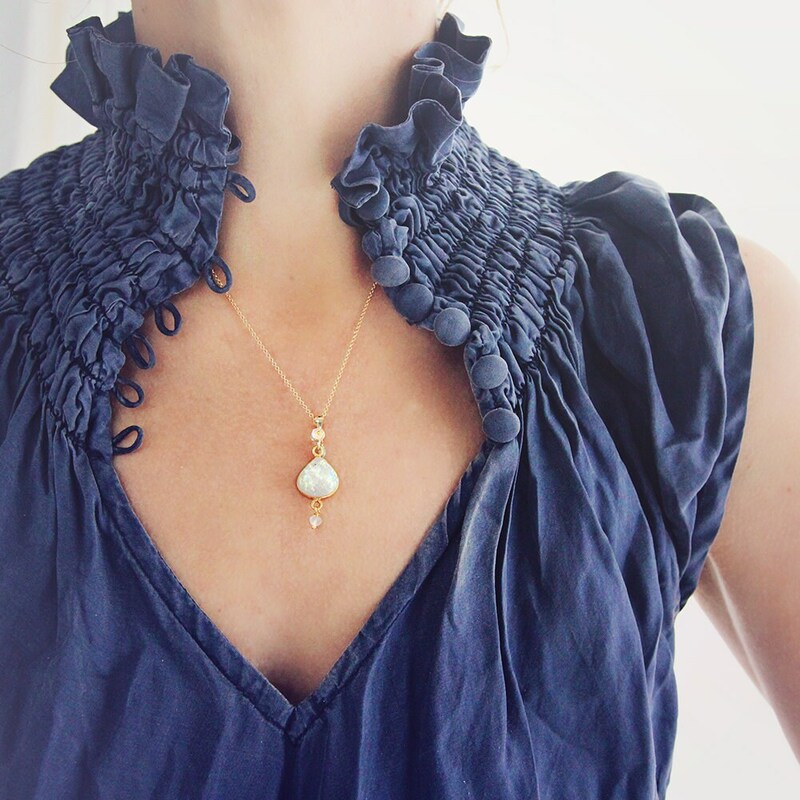 At the bottom hangs another little moonstone gem that dangles seductively and brings lovely movement to this fabulous necklace. 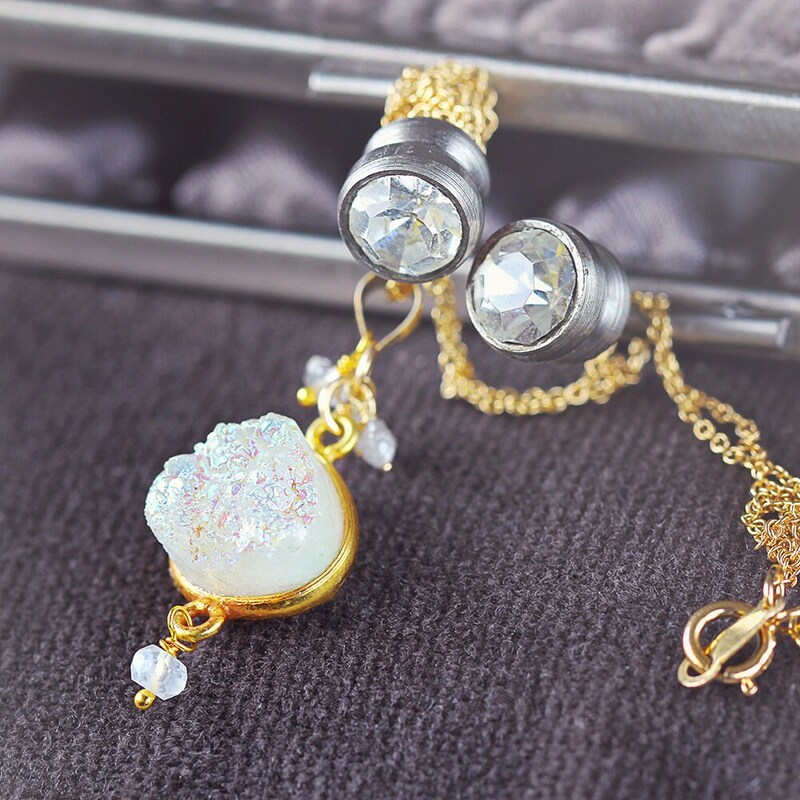 The druzy and gemstone pendant hangs from a 14k gold filled chain. Gold fill is also known as 'rolled gold', it's the next best quality after pure gold - it's not a plated finish and therefore doesn't rub off. I love this necklace, and cannot express just how pretty, sparkling and exquisite it really is. Personally I don't think the images quite show it's delicate and enchanting beauty, but I'm sure you will be delighted at it's sensual opulence once you hold it in your hands. This necklace, as well as the matching bracelet and earrings are perfect for bridal wear and make a splendid set worn together. 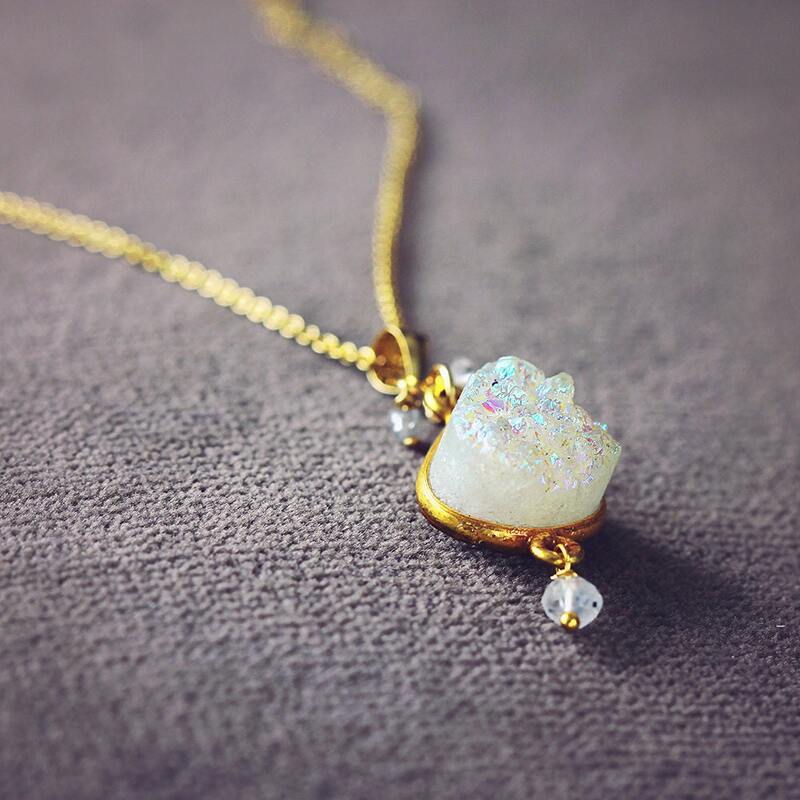 Lightweight, luxurious and easy to wear, this white druzy and gold necklace make a fabulous gift for friends, family and loved ones. Or better still, just keep it for yourself! You may choose between a 16 inch | 40.5 cm or an 18 inch | 45.5 cm length chain. Matching earrings and bracelet are also available.